After parliament voted 432-202 against her deal, opposition Labour leader Jeremy Corbyn promptly called a vote of no confidence in May's government, to be held on Wednesday. 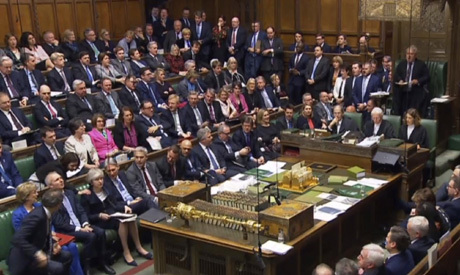 More than 100 of May's own Conservative lawmakers - both Brexiteers and supporters of EU membership - joined forces to vote down the deal, leading to the worst parliamentary defeat for a government in recent British history. May's spokesman told reporters that May's deal could still form the basis of an agreement with the EU, but opponents disagreed. "The withdrawal agreement is now dead," David Jones, a Conservative pro-Brexit former minister, told Reuters. "The EU will see that it must now offer better terms to the UK. If it does not, we must leave to trade on WTO terms." "The risk of a disorderly withdrawal of the United Kingdom has increased with this evening's vote," he said. Donald Tusk, the chairman of EU leaders, suggested Britain should now consider reversing Brexit. "If a deal is impossible, and no one wants no deal, then who will finally have the courage to say what the only positive solution is?" he tweeted. "After two years of failed negotiations, the House of Commons has delivered its verdict on her Brexit deal, and that verdict is absolutely decisive," Corbyn said. "Her governing principle of delay and denial has reached the end of the line."